Looking for feedback on flatbed trays. Holy $$$$$. There are far cheaper options, IMHO. Before you lay your money down on whichever flatbed you pick, do yourself a favor and check if it is square by measuring from corner to corner diagonally and check if the sides are parallel and rails are the same length. It doesn't matter if you are just stacking hay bales on it but will when you try to line up a camper on it. My Aluma flatbed is an inch out of square and wider in the front than it is on the back. I didn't catch it until way too late to do anything about it and ended up cutting the front bulkhead off and rebuilding it which was quite a bit of work and frustration. Also, note that most campers designed as a slide in have grey and black water tanks that drain out the bottom. That works if there is an overhang but if you are mounting on a flatbed it might not. I strongly recommend no overhang and remove your jacks once you have the camper mounted but to do that means no tank drains out the bottom. Most camper manufacturers that make a flatbed specific model including Hallmark and FWC have figured that out and are using cassette or composting toilets and the grey water tanks drain out the side. Watch for this when picking the camper to mount on your new flatbed. Last bit of hard earned wisdom: Flatbeds open up a ton of previously wasted space under the bed. Pick a manufacturer that makes tool boxes as well so you can use that space. Highway Products has been mentioned here and you should look at Protech as well for flatbed/toolbox options. All my boxes are by Protech and they are very well made. Was your FB custom built? I know they mass produce some popular sizes and bulk ship to dealers. Wonder how many come catty-wompus from the factory. Were you able to work-around the issue? Thanks for the leads on other FB builders. I talked with FWC yesterday and they emailed me a list of FB builders as well. I'll see if I can post the list here. We are still considering a dealer inventory slide-in Granby vs the FB. We would have to do a rear bumper with storage boxes to make that work but the savings is significant. Have you considered tray bed by XP Campers? They sell the trays as a stand alone product. I purchased both the tray and the camper a number of years ago and have since sold the camper for family reasons. Both are excellent products and important to this thread, the tray has served me very well. The tray bed is very durable for use (lumber, stone, etc), the storage boxes can hold a lot of what ever you want. XP offers accessories such as a headache rack and drop sides, so the bed has use when the camper is off. XP will also make other storage boxes that can be mounted on the bed. I would recommend looking at XP. They are pricey, but you get a great product for your money. Nope - it was dealer stock and they wanted to get rid of it so I got a good deal...or so I thought. I suspect that more flatbeds are "catty-wompus" than not but it usually doesn't matter if you are using it to haul freight. I fixed the bulk of the problem by cutting the front 6" of the deck and the bulkhead off and welding a channel on to close the front of the flat tray. The sides are not parallel so I split the difference and snapped a line from front to back down the center of the tray and squared to new front to that line. It's not perfect but its better and it works. With my application the bulkhead wasn't needed and just used a couple of inches of precious space. The shortened length matches our new camper floor so there is none of the flatbed exposed with the camper mounted. Read my post regarding "New Hallmark Flatbed Camper" and might make more sense. The flatbed are behind the teak doors is actually a separate little flatbed that I made to fill the gap. There are two mountain bikes in that space. I watched a video about the XP flatbed. It looks very nicely constructed. Certainly needs to be on the list. Thanks. XP makes the integrated pull out side steps for their flatbed which looks awesome. 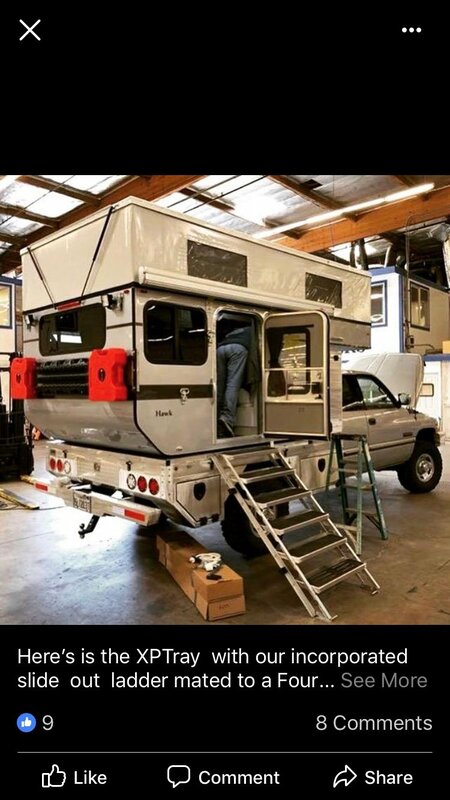 The large scissor steps that seem to be most commonly used to access a flatbed camper seem like a PITA to me. See XPs FB page for more photos. Very slick set-up for those steps. I like the rear drawer that Norweld offers but putting the stairs in a sliding compartment is really nice. I may be wrong, but I think the xp camper has a sliding rear drawer just like the norweld, as well as the stairs. Food for thought. I grew up farming and ranching, love my flatbed. Its a CM, the bed is ok, i cut off the steel deck this winter an replaced it with wood. My insurance also went down w/ the flatbed. I have under body box,s for the front and the rear i still need to install. Was about 2400, with the tool box's and after I installed. The comment about the mass produced ones not being square is dead on, mine was not either. I had no idea until i cut the steel out and was adding wood. I would recommend a treated wood deck, but to each their own. None of them are going to be cheap, like many of the farmers around here the bed gets switched from truck to truck, when the old ones retire. Is the general industry thought process, you can also usually find local builders, just have to know where to look. I'm going to OK this weekend to see the GF's family and we plan to look at some flat beds while out there. CM seems to be huge out there so it shouldn't be too hard to find some in-stock stuff to look at. It's a little "cart before the horse" since I haven't even put my 4-Runner up for sale (waiting till after Expo) and we don't have a truck but we know what we are going to buy so getting an idea of build quality is worth a bit of our time. You may even be able to find something with a bed already on it. Good luck, we would love top see what you end up doing once you know .